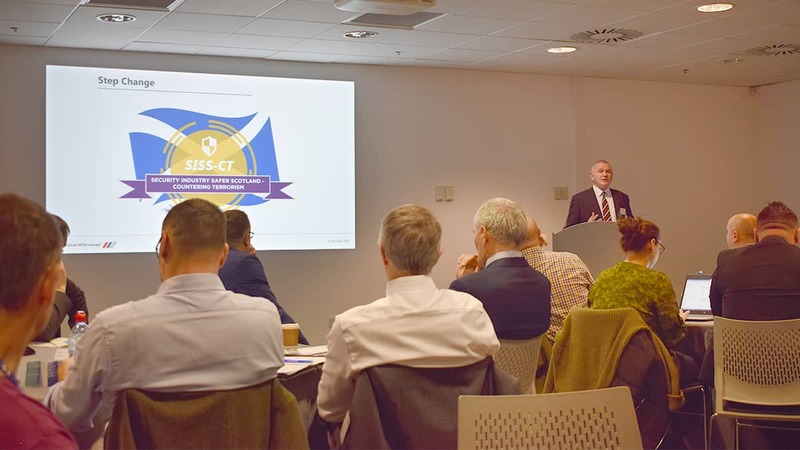 SecuriGroup was invited by 'Security Industry Safer Scotland' (SISS-CT), which is a Police Scotland and SIA workgroup, to provide an input at a counter terrorism event held at the SEC Campus. The event was led by an engaging keynote speech from the Cabinet Secretary for Justice, Humza Yousaf MSP. He later said "The security industry play a vital role in keeping us safe, not just on a day to day basis but also during crisis situations." Following this were presentations from, SecuriGroup Operations Director, Allan Burnett QPM FSyI, Deputy National Coordinator for Counter Terrorism Policing, Showsec Director Mark Harding, and inputs from the SIA and Police Scotland. In June 2017, the Security Industry Safer Scotland – Countering Terrorism (SISS-CT) was created by representatives from the Scottish Business Resilience Centre, Police Scotland, and the Security Industry Authority. The aim of the group is "enhancing the capacity and capability of the security industry to counter terrorism." Funding has been secured by the group from the SIA for Police Scotland to pilot a new counter terrorism awareness package – similar to the now defunct Project Griffin – which will include chose Griffin modules complemented by bespoke table top exercises. Senior members of the security industry assisted Police Scotland Counter Terrorism Security Advisors (CTSA) in developing this package. It has been agreed by NaCTSO that Scotland can pilot the new presentation – the first stage of which will run from January to May 2019. Allan Burnett QPM, SecuriGroup Operations Director, provided an engaging input which focused on the merits of private security organisations and the benefits to be gained by further developing the links between police services. To illustrate his point, and to celebrate the contribution the industry has made to counter terrorism events, Allan discussed the exceptional actions by security teams faced with the some of the largest attacks in Europe in recent years. These range from the security professionals in Borough Market who challenged attackers and ushered the public into venues with shutters, the security in the Bataclan who rushed audience members out back doors while attackers were distracted; and the steward at the Stade de France who rejected an attacker from entering – an action which saved many hundreds of lives. These examples, and the countless number of foiled attacks, show how so many lives can be saved by so few – highlighting the true value of counter terrorism awareness and training.